This is another warmer weather pic taken along Dundas St W. When trying to get a pic of the barber pole in this window I realized what a great reflection there was of St Helen Church across the road. That's a perfect reflection. A very nice shot! Hello, awesome reflection. Great capture. Happy Friday, enjoy your day and weekend! Like the play on words for this photo. Wonderful reflection. 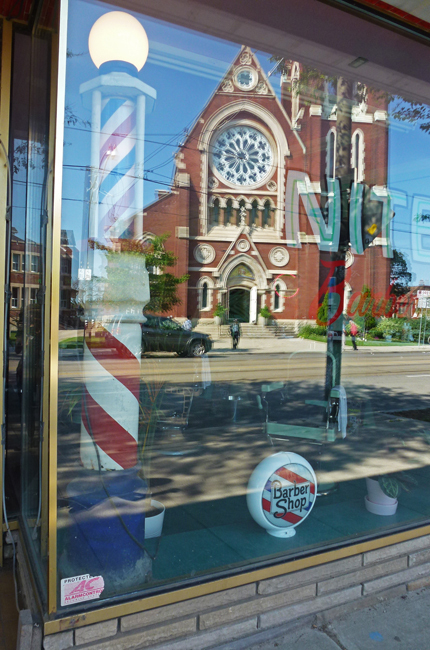 You photographed two important institutions, church and barber shop. Serendipitous Pat 😊 excellent reflection of the church. Not very many of those barber poles left in these parts which is why this photo is such a special treat! Great reflection, too. St. Helen's church is such a classical structure. Cute title, also! The reflection makes the photo. I like that you got someone just outside the church. Great shot. Oh wow! That is a great reflection. I like the barber pole too. Someone's keeping that window very clean. This reflection is very beautiful. A great reflection that is! Very cool. At first glance I thought it was one of Toronto's many murals.